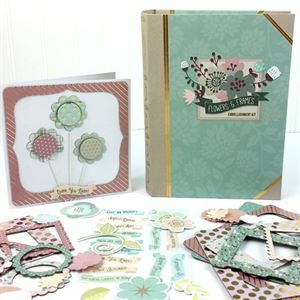 This beautiful embellishment kit is bursting with flowers and frames in lovely, soft colors. Use chipboard frames of all shapes and sizes on your scrapbook pages, cards, and crafts. Embellish with chipboard and die cut blooms, vines, and leaves. This beautiful embellishment kit is bursting with flowers and frames in lovely, soft colors. Use chipboard frames of all shapes and sizes on your scrapbook pages, cards, and crafts. Embellish with chipboard and die cut blooms, vines, and leaves. Add buttons, epoxy sticker sentiments and choose from over 200 paper flowers to add the perfect touch to your projects.